World Class Storage Solutions From Pride! Need Storage? Pride Moving and Storage of Boulder Colorado has the facilities to meet your needs and your budget. If you need storage between moves or you just don’t have enough room in your new location, we have a solution for you. 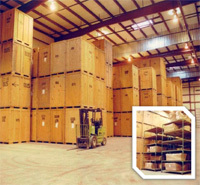 Pride offers modern, safe, and convenient storage warehouses to meet your short or long term storage needs. Our storage services can secure your belongings for any amount of time. Our new 10,000 sq. ft. warehouse is waiting for your storage. Our warehouse is temperature controlled and secured. We will be able to handle all your needs. We will send out a team of professional movers to pick up your storage. They will inventory everything. If needed we will then quilt pad your items, and transport them back to the warehouse for you. Professional crating and open floor storage available.